We had this for dinner last night, and it was pretty good! It looks as good as it tasted. This is a very easy meal, because the only things I had to make were pico di gallo and guacamole. And the guacamole just had the pico added as the flavor. A great way to add this into a weekly meal plan is to have pork roast with BBQ sauce one night, pinto beans and cornbread the next and then later in the week use those leftovers to make Taco Carnitas. You could even make the pico di gallo the night you do the pinto beans and use it as a garnish, then it is ready for the Carnitas. I had already cooked the Pinto Beans, so those just needed to be heated up. I actually added some mexican spices like cumin and chili powder to liven it up a bit. You could just used canned pintos or refried beans in a pinch. The pork roast was leftover from the last time I made a big pork roast. I just froze it in 2 cup portions with the juices to keep it moist. I had no idea cooked pork froze so well. Once it thawed out, I just put it in a small pan on very low heat and I added some chili powder, cumin and a little lime juice to spice it up. I like to layer the flavors all throughout the dish. That means to add the same flavor to each part of the dish, i.e.) the pinto beans, pork and then in the pico and guacamole. It makes it have a rich, full dept of flavor, that means it makes it good! 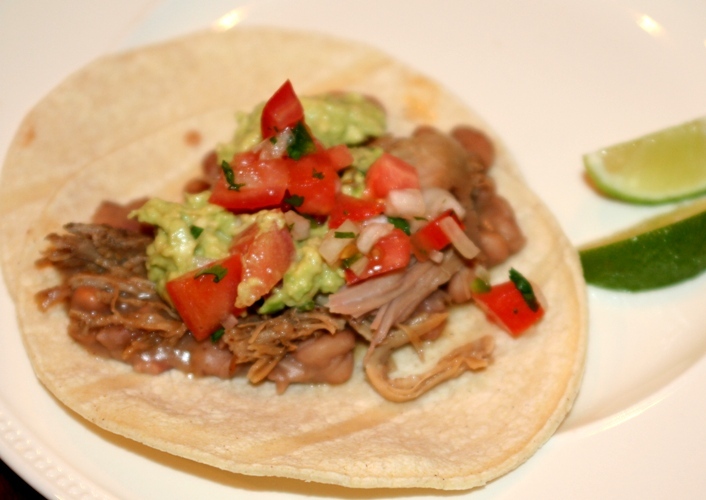 Lastly, I prefer the corn tortillas in this type of taco, I think it is far better than flour! First I make the pico, and then use the pico to make the guacamole. Combine all ingredients and serve fresh. This turns watery the second day, but is still really good! Add all ingredients together and serve fresh. Cover leftovers with plastic wrap directly on top of guacamole. Heat tortillas in a damp paper towel in the microwave for about 20 seconds. Use two tortillas per taco and layer on the remaining ingredients. Be careful how much juice you add, it breaks down the tortilla and mine broke! That looks amazing. I just happen to have leftover pork roast. I already made soup with white beans and pork. I will make this with the rest of the leftovers. Thanks for the good idea. I am definitely adding this to our menu next week! Yummy!!! add some fresh minced garlic to that pico di gallo and you’ll be blown away!